Hi everyone! So today is the last day of posting a blog for Propel! How sad?!? But anyway, I finished my dog house! It's all done and painted as you can see below:) I am going to be drawing my own things onto it soon but not right now. It is so sad to think that this program is already over in few weeks but I am very excited to go back to J.H. Bruns to see all of my close friends! Anyway, I hope you all enjoyed my blogs throughout the semester and enjoy the next couple months of winter. Since my last blog post I have Finished my entire dog house, like putting the roof on it and also placing the shingles on top of it. I only need 2 more shingles to actually finish the entire thing then I can move on to painting and trimming it. I ran into a couple of delays during this past week since monday because I didnt have enough wood to finish the roof but that problem was solved today!! I am very pleased with how my dog house turned out. This program let me make more friends then I would have if I didnt come here, and I am very happy that I met my bestfriend Izzy along the way. Today I wont talk alot since it is Christmas Break! last day before Christmas. Which means Propel is almost over.. I made alot of progress in building my dog house this past week. I just finished building the frame for the roof today and I am so beyond excited to put the plywood for the walls on when I get back from the break! Donating it to Manitoba Mutts will be a great thing to have in their shelter because all of the Mutts will be able to enjoy it. I am thrilled to be able to give it to them. I dont really have much to say so I hope everyone has a Merry Christmas and a Happy New Year! In the Propel Head Quaters we have many visters showing up into our classroom wanting to learn more about what we do every single day. Just this week we finished our last toastmasters program. Toast masters is a program about making speech presentations better and more professional so that we can have better presentations for our end of the semester speeches. In the HQ of Propel we interact with many different people coming into the building. We listen to music on our new surround sound music system. We have gotten so many questions about our program like "do you even work"? and the answer to that is yes, we do work, we work by creating our own projects and some of us even have to build and measure things. Some people have to write poems or even make a movie that looks pretty profesionl which takes alot of work and effort to do. In the head quarters of Propel we like to bare down and get our projects done but we also like to have some laughs and breaks inbetween the process of finishing our projects. Today I am not going to talk about my project. I am going to talk about my classroom and the adventures we have done. since the start of the year I have grown strong relationships with my classmates and have been able to hangout with them and was able to help them with their projects and with whatever they needed. We have gone to a couple of field trips to WE DAY and also to Epic Escape to get out of the classroom environemnt. We also walked to The Forks one day and got to learn a bit more about its history. I am very happy with joining Propel because if I didnt I would have met one of my bestfriends, Izzy. One tip for the students comeing in next semester, make sure to have fun but also dont crunch your time for your project becvause youll need as much time as possible to do your final project. This passed week I have been cutting and screwing all of the boards together to make the frames for the bottom and the two side walls. I have run into a couple of road blocks due to not enough wood for the front and back wall so I will need to take a trip back to Home Depot and grab some more 2X2 studs. After I get all of my wood I will be able to cut the plywood to put on top of the frames in order to make the dog house more solid. Getting this project done soon will give me the chanc to donate it faster. This past week I have been communicating more with my class mates and getting to know more of the people that originally go to the new school that I am at for this semester. My project is going good so far I have picked up my supplies for the dog house and I am now ready to start measuring and cutting the plywood. I am very excited to donate the dog house to either Manitoba Mutts or the Humane Society. Today I would like to talk about the progression that I have done towards the making of the dog house. From the last block post I made I have done alot more since then. I have made up the purchase order for the supplies that I will need from Home Depot. I will moat likley be picking up the supplies sometime next week I hope so that I can get down to the woods room to start cutting and building the dog house as efficient as I can. I am very excited to contact Mantioba Mutts or the Humain Society (which ever rescue shelter needs a dog house) about donating it to one of their facilities. I am hoping to get the dog house done before christmas break so that all I will have to do is Prime it and also throw a couple of dog paintings on the walls. Today I would like to talk about what I did this week in school. The Propel class got the opportunity to go to the Human Rights Museum for a conference about being media smart and to teach students our age about what do to and what not to do on social media. I didn't really enjoy the conference. We got to create our own vines about unwritten words on the website. But didn't understand what that had to do with being media smart on the Internet but over all the conference was very nice and in a very nice environment. 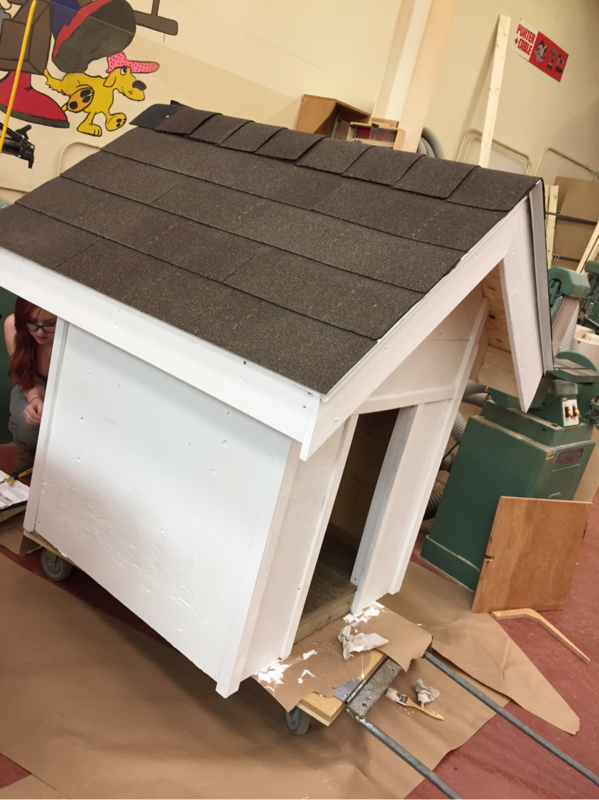 Also this week I got to do a tone of work on my Dog house project that I will be donating after it is all finished. So today I would like to talk about how my project is going. For my project I am building a dog house where my dog Ollie can have his own little sleeping area during the winter and even in the summer. So far I have planned out all the materials and tools that I will need. I've been asking myself questions like, how to build the walls, floor and also the roof, so that I can have a better understanding from being more organized. For my dog house the tools I will need are simple "at home" tools like a hammer and essentially wood glue. I am very excited for my dog house to be done so that I can draw my murals on top of it and have fun in the building process.